Harry and Barbara have run their gallery/studio in Bude since 1990 after a long family association with Cornwall resulted in a permanent move here with their young family. Growing up mainly abroad (Malaysia, Canada, Ireland) Harry graduated from Trinity College Dublin in 1976 (B.A. Mod. Nat. Sci.) and became an artist/illustrator in Dublin. He was employed by The Irish Arts Council as Cork Art Society's first Administrator and later became a Gallery Manager in Baggot Street Dublin. At this time he had several one-man shows and exhibited with: ROYAL HIBERNIAN ACADEMY, OIREACHTAS and WATERCOLOUR SOCIETY of IRELAND. After moving back to England he had a one-man show at the GINGER GALLERY, BRISTOL (now the Lime Tree Gallery, Hotwells) and an introduction to many galleries in the Southwest from Taunton to Truro and Padstow and Port Isaac to St.Ives and Penzance. His Cornish seascapes have been exhibited at the ROYAL SOCIETY of MARINE ARTISTS, Carlton House Terrace, The Mall, London. A major illustration project with the RED CROSS and WORLD HEALTH AUTHORITY Geneva, resulted in the publication of 'First Aid in the Community' a manual for volunteers in Africa, (ISBN : 93-9139-002-X) followed by further contracts with WHO illustrating manuals for aid workers in the third world. For many years, as a local lifeboatman, Harry and Barbara ran the Easter LIFEBOAT ARTISTS exhibition at the Brendon Arms, Bude raising funds for the RNLI. Recently, he has produced a series of illustrated panels, carved in Birch ply, with a nautical and beach theme for the restaurant and bar of Tommy Jack’s Hotel at Crooklets, Bude. 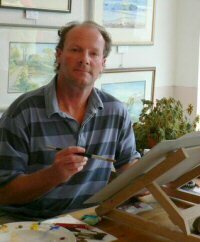 He is currently illustrating a series on Cornish Shipwrecks, coastal flora and beaches for John Brady Associates and a range of popular London images for Awnhill Ltd.,. London. Harry can be commissioned to paint an image on request and is often asked to paint scenes of Bude, especially of families on the beach. Please ask. Through The Gallery they continue to provide paintings for both locals and visitors alike who love Cornwall and it's coastal scenery and landscape.